The best option to see the two essential monuments of the city. Your official guide will accompany you in each monument, skipping your tail in both and you will not miss any detail with the stories it will tell you. Plaza del Triunfo (next to the monument stairs). This tour includes the climb to the Giralda, from where you will have spectacular views. We manage the purchase of the ticket for you. Once you buy the tour you should not worry about anything else. So that you do not miss a detail of the fantastic history of this monument we propose this tour where you will go in a maximum group of 12 people. In addition to touring the monument and its gardens in depth, we will go for a walk and discover the mysteries of the Barrio de Santa Cruz, the old Jewish quarter of Seville and end up in a trendy bar toasting with Orange wine. Undoubtedly the best option to know the Alcazar and its surroundings. Ticket, tour and headphones included in the price. 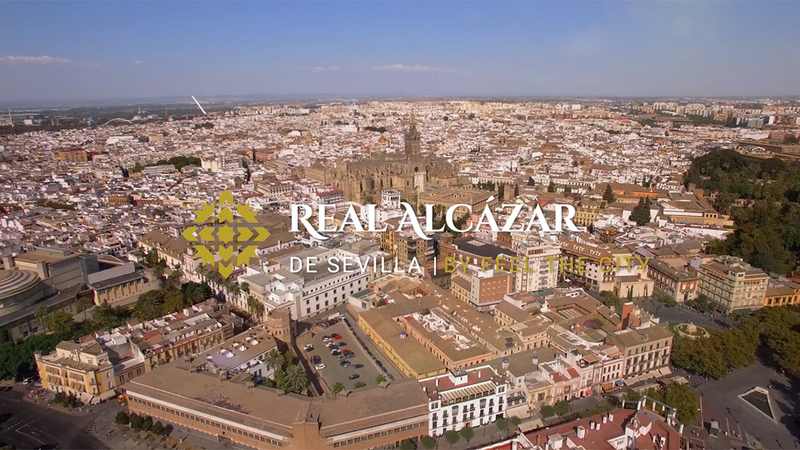 We will know the history of the Reales Alcázares of Seville in depth. This monument keeps many stories and details that would be very difficult to know without a local guide. We propose that you come to travel history from the Almohads to the current kings and that you are surprised by the Royal Palace in Europe´s oldest active. When we finish the tour you can stay to relax in its incredible gardens. You can not miss this tour during your visit to Seville. Maximum group of 30 people. Visit the Alcazar on a private tour, at the time of your choice and with whomever you want. All of our tours are official. I have understood that the tickets for the monuments are not included in the selected tour and they will have to be paid to the guide when checking in. "Seville and the world, everything is one, because everything is undoubtedly all abbreviated". This is how he described the 17th century playwright Agustín de Rojas Villandrando, and so our eyes continue to see it. Because Seville is a city that rests on streets bathed in tears of kings, artists, scientists, merchants and poets. Walled between buildings that present footprints of its myths, history and legends, when you visit the Alcazar you enter the real and magical Seville. And if you have not yet visited their rooms or dreamed in their gardens, we give you 10 reasons why you have to see the Alcazar of Seville on one of our guided tour. The Real Alcázar in Seville, also known as Reales Alcázares or Alcázar of Seville, is the oldest active royal palace in Europe. Since its origin linked the dynasty of the Umayyads, the Arab kings of Al-Andalus who ruled Seville in the High Middle Ages, has it been a royal residence. It is for this reason that the most illustrious and famous people of its time have passed through its rooms, gardens and corridors. And, therefore, the most unusual events have happened. Its corners are full of secrets carved throughout its history and its walls have witnessed the most interesting and important events of its time. In this article we have prepared a selection of 4 real events that took place in the Alcazar of Seville that you will surely find very interesting, and incite you to see it with us. Why do you have to see the Gardens of the Alcazar of Seville? The Persian Sheikh Saadi, one of the main Persian poets of the Middle Ages, said that "the garden is a delight for the eyes and a consolation for the soul". Perhaps it was this consolation that the first Arab kings sought, who designed a set of gardens connected inside the Reales Alcázares of Seville. Thus, the former orchards were transformed into beautiful royal gardens. Gardens that flowed with the passing of time, like river water, which - Heraclitus told us - despite looking the same, is never the same. Nor have the gardens of the Alcazar of Seville always been the same. Despite being the oldest gardens in Sevilla, they and their history have changed over time to become one of the most beautiful and special gardens in the world. Gardens that you have to see if you visit Seville, and that we want you to see with us in one of our guided tours by the Alcázar.